The HIMSS war has begun, where the wide-eyed newbies huddle together in chattery excitement while the grizzled veterans with far-away stares trudge off to fight the latest of too many ugly battles. Jenn, Dr. Jayne, and I will post as we have time and anything interesting to report. Experience has jaded me so that I don’t get wrapped up, as many people do, into cramming events into every waking hour. I’ll choose drifting peacefully with the health IT current instead of swimming hard upstream. From Skeptical: “Re: KLAS report on interoperability. I wonder if it’s an FTC violation that KLAS doesn’t disclose the financial relationships with the vendors they’re rating? Plus, wouldn’t it be valuable for CIOs to know how much each ranked vendor pays KLAS?” That’s always the question with KLAS. I suggest that KLAS implement a star system to indicate their relative income level from each vendor. They don’t have to tell us the exact figure ,but it would be nice to know when reading a report about Epic and Greenway that they’ve earned 10 KLAS payment ranking stars vs. two, respectively, although that gives vendors incentive to pay less instead of more. From Gettin’ Jiggy: “Re: Allscripts. Elation, CareCloud, and Athenahealth will win business as the company starts charging for Practice Fusion without plans to enhance it. We still don’t know what will happen with the Care Otter product that’s being developed within a siloed organization that has shunned help from more experienced Allscripts resources. If it flies, they will surely sunset some of their reliable, stable EHRs, although client-server systems – especially for small practices – need to die. The company’s big product gap is not having a cloud-based PM product, which is needed to stem their customer losses over the past few years.” Allscripts has two problems with Practice Fusion: (a) most practices implemented it only because it was a free way to cash in on Meaningful Use money, and (b) whatever percentage of its users who are willing to pay for an EHR won’t necessarily find Allscripts products more attractive than the ample alternatives. I’m not sure any level of enhancement would help since the Practice Fusion customer base didn’t seem to care about functionality gaps enough to replace it. I also don’t know how Allscripts will mobilize a sales force to reach out to Practice Fusion customers before they start looking or digging back out the manila file folders. I’ve had one visit to a Practice Fusion-using practice and they only lightly used the online portal part – it was all paper forms otherwise even though they look like a “customer” to the company. 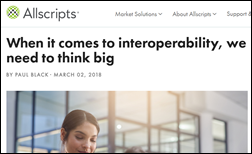 Allscripts CEO Paul Black pens an editorial criticizing the just-released KLAS report on plug-and-play interoperability, which noted that Allscripts doesn’t participate in the highly-used Carequality or the lightly-used CommonWell. He says KLAS should have considered other available interoperability options such as point-to-point interfaces, HIEs, and APIs. Cerner is also apparently unhappy with the report, which said its CommonWell-centric approach has limited the connectivity options of customers until the CommonWell-Carequality connection opens up access to Epic-using sites. VA Secretary David Shulkin convinced reporters last week that he had squelched VA insiders who were conspiring with White House officials to get him fired, but new reports suggest otherwise. VA OIG previously said Shulkin took a family Wimbledon vacation at taxpayer expense and an upcoming report will say he used his security detail to run personal errands. The Daily Beast cites several sources who said Shulkin is now “extremely paranoid” in posting an armed guard outside his office, cutting off access to his floor by those VA staffers he suspects of being disloyal, and attempting to fire several political appointees who were saved by White House intervention. He’s on the HIMSS agenda for Friday if he makes it that long. CHIME CEO Russ Branzell will receive a Baldrige Leadership Excellence Award for his work in cybersecurity. Every year I write several times right before the HIMSS conference that companies are unwise in holding off their announcements for this week, when they are sure to be missed in the mayHIMSS, yet most still do. This tip is courtesy of my Lyft driver last night. If you rideshare to or from the Sands, use the Venetian’s pickup and drop-off area since it’s a lot easier for drivers to get in and out. I used it last night and was impressed that the Venetian places a uniformed guy there to keep things moving and to remind people to choose the Venetian pickup option instead of the other two locations that Lyft also shows from that spot. Today will be the coolest of this Las Vegas week, with a high of 63 that runs up to 77 by Thursday. It got chilly quickly last night, making me glad I’d worn a long-sleeved shirt but sorry I didn’t bring a jacket. Today we will set up our tiny booth and maybe check out the afternoon keynote and opening reception. More to come. If be curious to compare the mitre report on interoperability to the klas report. Paul Black’s piece is embarrassing. Point to point? Really? I thought they were a founding member of CommonWell… As was McKesson, whose stuff they bought. School Me and Skeptical must be the standard Allscripts and Cerner shills ready to pounce on unflattering news. Epic simply leads the nation and likely the world in interoperability of all kinds. Enough with your lying and trash talking posts. AllScripts can count HL7 burn then they’d looking even dumber by comparison. Cerner has accepted that CommonWell is a failure and everyone else sold Out or never implemented it. Let’s just move on from this dribble and use Carequality. Ceener can fool the DoD/VA with their interoperability claims, but the reality is very much different. Epic is way ahead. KLAS isn’t as independent as they might claim, but I’d place my Vegas money on Cerner/Allscrips paying then off before Epic. Agree, the logic doesn’t add up. Cerner is twice the size of Epic with twice the revenue and probably 20 times the marketing budget. If KLAS could be bought, wouldn’t Cerner have done it? Just because they can doesn’t mean they are stupid enough to want or need to. Nope. KLA$ doesn’t make much money off Cerner and never has. KLA$ used to be the only ratings game in town, and now they have competitors with better methodologies and no $ecrets. This KLAS bashing makes me want to scream! Love or hate KLAS they have made both the provider “buyer” community and the vendor “seller” community pay them for telling them what to do. First you have to understand the founders of KLAS are all prior leaders of a HIS vendor and top notch salesmen from days gone buy. They were very successful in that world and they simply used those skills and tools they honed selling hospitals IT systems to sell them on needing someone to measure the vendor community and the vendor “seller” community on needing someone to tell them what they clients wanted and what their competitors where doing. It’s the perfect storm of a sales job!! And all you bought it! They knew no vendor could pass up the notion of competing against its competitor as healthcare is such a lead/follow vertical once any provider stated they used KLAS then other just followed, because no one wants left out. So in the end what KLAS has done is a A+ sales job on all of you! And the irony is the providers and the vendors keep buying what they are selling. KLAS don’t have to change to fit what you want, you can either contuine to buy what they are selling or don’t, but don’t complain about what they are selling because without you the provider “buyer” and the vendor’s “sellers” ego they wouldn’t be selling it. In the end their business model is a thing of beauty that every vendor at HIMSS is envious. That is the simple truth! My advice to anyone who hasn’t made up their mind on KLAS is to go talk to the people in the KLAS booth and then the booths of their competitors. You’ll come away with a pretty clear picture of who understands health IT.